Have you ever wanted to allow your learners to collaborate or compete within a lesson? 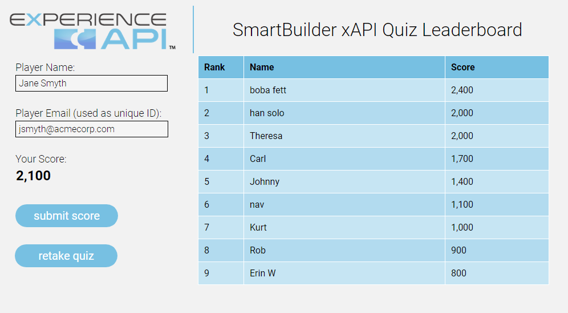 Well, thanks to the magic of xAPI and the power of SmartBuilder, now they can. I’ll share an example in a moment, but first, some quick background. I just completed the xAPI Cohort, “a free, vendor-neutral, 12-week learning-by-doing project-based team learning experience about the Experience API.” (source: Torrance Learning). We led one of the teams in the cohort, and last week we presented our results to the rest of the group. Here’s a sample quiz and leaderboard which demonstrates one type of learner-to-learner data sharing. We authored this in SmartBuilder and it’s communicating with the SmartTracker LRS. To get an overview of our xAPI Cohort project and how the leaderboard was created, watch the session recording from 09:30 – 25:00. In addition to the leaderboard, near the end you’ll see an example of a quiz/poll where learners can see how other learners answered the same questions. If you’re thinking of using xAPI or are just interested in learning more about it, I highly recommend that you join the next cohort (it’s run twice a year). If you have ideas for data sharing, or for xAPI in general, please share your feedback in the comment section below. Could we create something like this and launch it from our LMS? Yes, there are a few way this can be done. Since you’d be using xAPI for the leaderboard, or whatever collaboration/competition feature you have in mind, it will need to communicate with an LRS (Learning Record Store). The easiest way would be if your LMS has an integrated LRS. In this case, you could configure your SmartBuilder lesson to communicate with the LRS by typing in a few parameters into a file after your lesson is published. If you don’t have an LRS, SmartBuilder provides an integrated LRS called SmartTracker. In this case, you would probably grab the learner name and ID from your LRS using SCORM and then use that to identify your learners (or ‘actors’ in xAPI temrinology) when sending the data to SmartTracker. If you contact SmartBuilder support we can give you a more detailed answer.